When a Directory Server involved in replication is stopped for regular maintenance, it must be updated immediately when it comes back online. In the case of a supplier in a multi-master environment, the directory information needs to be updated by the other supplier in the multi-master set. In other cases, when a hub or a dedicated consumer is taken offline for maintenance, when they come back online, they need to be updated by the supplier server. Even if the replication agreements are configured to keep the supplier and consumer servers always in sync, it is not sufficient to bring back up-to-date a server that has been offline for over five minutes. The Always Keep in Sync option means that the server generates a replication operation for every update operation it processes. However, if this replication operation cannot be performed because the consumer is offline, the operation times out after 10 minutes. The procedures described in this section can only be used when replication is already set up and consumers have been initialized. To ensure that directory information will be synchronized immediately when a server comes back online, use either the Directory Server Console on the supplier server that holds the reference copy of the directory information or a customizable script. 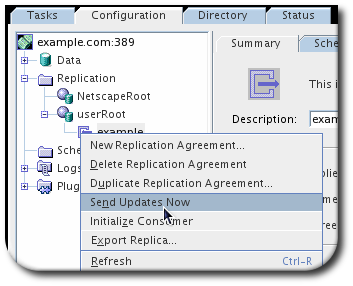 In the Directory Server Console, click the Configuration tab, expand the Replication folder and database nodes, and select the replication agreement corresponding to the replica to update. Right click the replication agreement, and choose Send Updates Now from the drop-down list. This initiates replication toward the server that holds the information that needs to be updated. To force replication updates, disable and re-enable the replication agreement. For details, see Section 15.9, “Disabling and Re-enabling a Replication Agreement”.